Hi, I am interested in your 1996 Pontiac Firebird (stock #5111-CHA) listed on Autotrader for $17,995. I'd like to get more information about this vehicle and confirm its availability. Theres an instant appeal when you can find a sleek V8 sports car for an exceptional price. 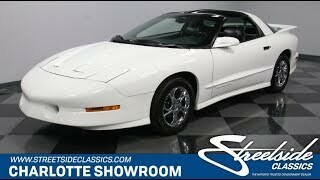 Of course, when this 1996 Pontiac Firebird Trans Am is also part of a new class of classics, you know this loaded T-top machine is the right one for you. This has a great-looking color combo, because after all, theres nothing more timeless than slick, white, exterior. The Arctic White paint has a sleek look that loves to reflect the sunshine. The dark T-top roof, tinted windows, black-out rear panel, and even details like the door handles, all come together to offer a distinct contrast. More than just the right colors, youll love this T/A for its sporty look. The pointed front end, quad exhaust tips, and a rear spoiler that flows over the entire trunk this looks fast just standing still. And the polished American Racing 16-inch alloys add to this sporty flair. The dark gray leather interior looks great against the exterior, and you get to share it with the world anytime you want thanks to the T-tops. In fact, with cold-blowing air conditioning, we bet you might leave the roof panels out all summer long. This is loaded with more great features, including power windows, power locks, keyless entry, dual airbags, and factory AM/FM/CD stereo with seven-band equalizer. Best of all, this is a machine truly built for the driver. Supportive bucket seats, comfy center console, a grippy steering wheel w/radio controls, and a full gauge package create an interior thats built around you. This is a modern classic, and so you get modern fuel-injected power. Upgrading a Firebird to a Trans Am means the 350 cubic-inch LT1 V8 from the Corvette program. It was rated at 285 hp when new, and by the pristine presentation of this low-mileage motor (averaging around 1,700 miles annually), we doubt any of these ponies have escaped over the last few decades. More advantages of a modern classic include the convenience of a four-speed automatic, which provides enough gears to be quick off the line, as well as cruise comfortably on the highway. Plus, with four-wheel disc brakes, power steering, and a limited slip differential, this is one fantastic all-around driver. This is the loaded modern classic with power and poise. So its great you can get it all for such an nice price. Call now!